Sometimes it’s worth living life on the edge. And when you’re in these awe-inspiring places, you may finally feel ready to take the leap. Consider this the perfect hideaway spot for those who really want a thrill. Accessible only by water, most locals will jet ski or boat to this cliff jumping spot, dock their ride, and then scramble up natural rock (don’t worry, they’re in the shape of steps) to reach one of four natural and manmade jumping platforms. Each is at a different height (ranging from 10 to 40 feet), making it perfect for those who want to “ease into” cliff jumping and those seeking a ton of hang time before hitting the water. 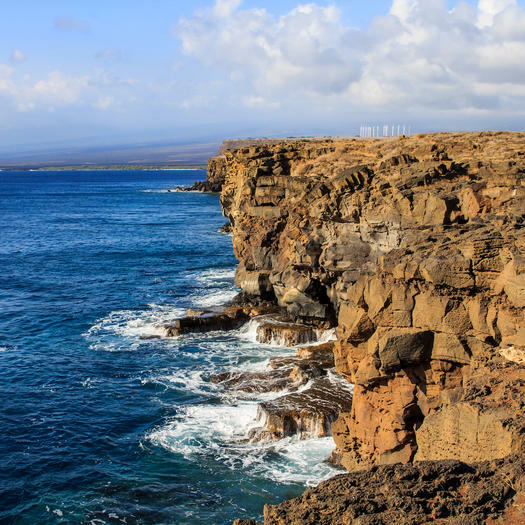 At the southernmost point of Big Island is the fittingly named South Point in Ka Lae, one of the most scenic cliff jumping spots in the world. 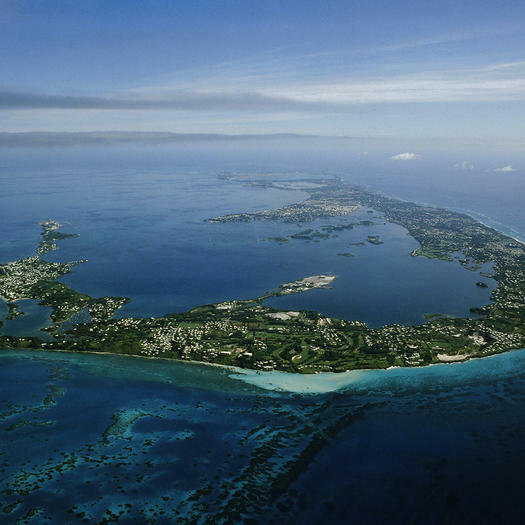 (Seriously, the surrounding area is registered as a National Historic Landmark.) Take your time walking along the rugged cliffs, most of which have a sheer drop-off, before stepping up to the rickety diving platform. When you’re ready, take the 40-foot leap into the refreshing, aqua-blue waters below. After, there’s a nearby ladder to help you climb back to the top. 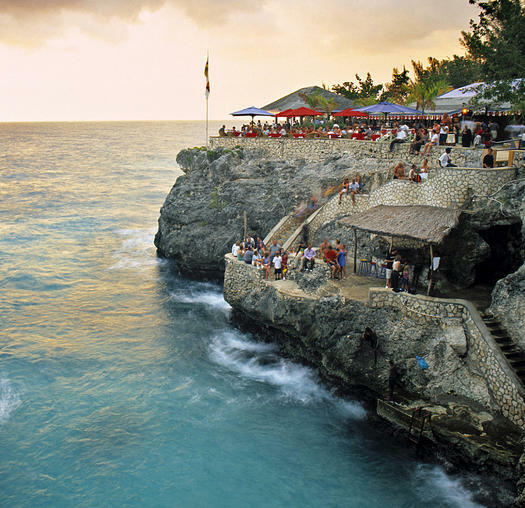 Pop by Rick’s Cafe, a popular alfresco restaurant that’s known for its breathtaking sunsets as much as its tourist-jumping crowd. It’s a 35-foot drop from the cliff before you hit the Caribbean waters, and there’s a lifeguard on duty for those who need an extra hit of reassurance (though signs do indicate that everyone jumps at their own risk). It’s true: Everything is bigger in Texas. 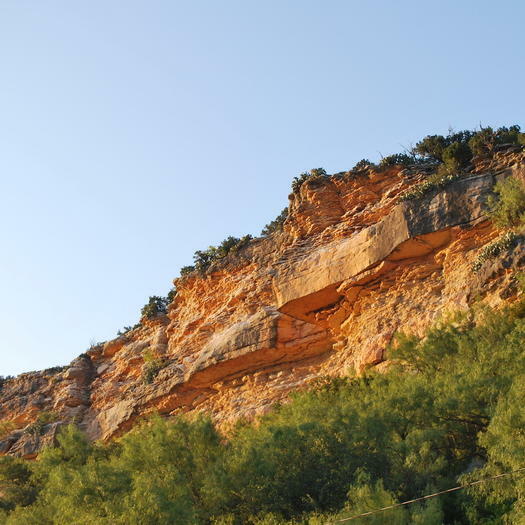 That includes Hell’s Gates, an iconic cliff diving spot at Possum Kingdom Lake that serves as one of the locations for Red Bull’s Cliff Diving World Series. 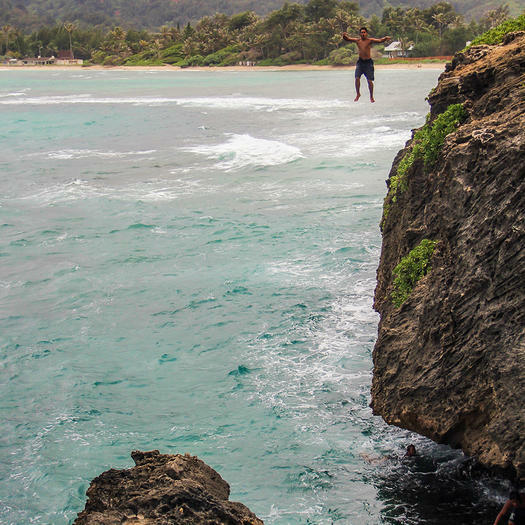 There you’ll find 90-foot cliffs—which isn’t legal or recommended for recreational jumpers—but pros can plunge into the 26-feet-deep water from those extreme heights. To stay safe and still feel a thrill, rent a boat or kayak so you can access any of the 15- to 20-foot jumps that locals leap from on the regular. 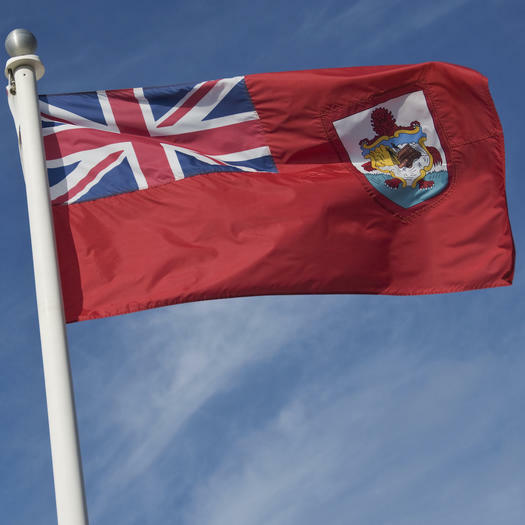 Another local favorite, this hidden gem is found in Admiralty House Park on Bermuda’s North Shore, where you can walk the old ruins and underground tunnels of a British Royal Navy admiral’s home. Once you’ve gotten your historical fill, follow the walkways to the cove, where you’ll find a quiet beach, lagoon-like waters, and jagged cliffs that practically beg for you to jump. Choose from a myriad of height levels; once you’ve had a swim you can climb back up to the beach on an ancient stairway that was blasted into the rock by the British military more than 100 years ago. 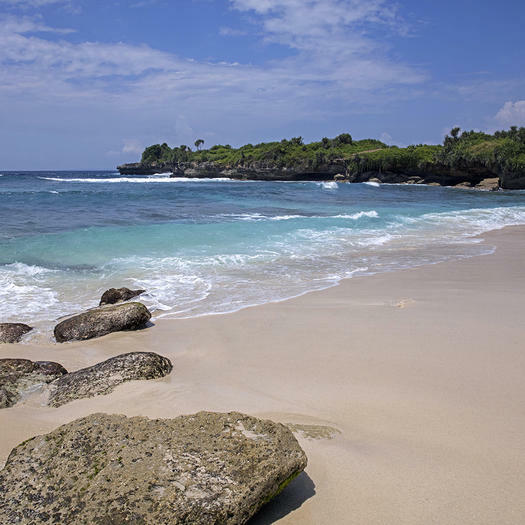 Don’t leave Indonesia without a stop at the Blue Lagoon on this Balinese island. 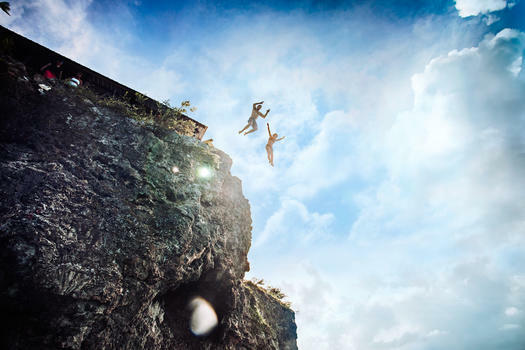 It’s a quiet spot for cliff jumping—most tourists just come to snap a photo—but thrill seekers won’t let that divert them. Walk to the left side of the bay until you find an abandoned hut with a bunch of art on it. There you’ll find different cliffs to jump from, ranging from 13 to 45 feet in height. Just monitor the wave swells before you dive in—if it’s high tide or the waves are big, save your jump for another day because you’ll have to wait for a gap in the waves to clamber back up the cliffs. Nobody can forget the hilarious cliff jumping scene from Forgetting Sarah Marshall (if you have, here’s a refresher). So if you find yourself on the north shore of Oahu, you might as well recreate the moment—ideally more gracefully than Jason Segel. It’s a 25- to 30-foot drop, and you’ll want to jump in summer. The waves on that side of the island get pretty big in winter, and you know the rule—safety first. 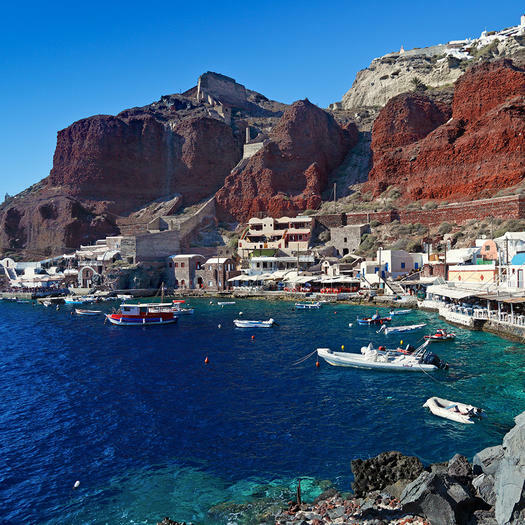 Greece is known for its cool Mediterranean waters, and there’s no better way to enjoy them than with a 20-foot cliff jump in Santorini. But you have to earn it: Once you arrive at the parking area near Amoudi Bay, there’s a rocky path that takes you to the jumping area. From there, though, you have to swim about 50 meters to the actual cliff, where you’ll then climb up its volcanic face (wear water shoes for this to protect your feet). By then, you’ve made it. Soak in the views, take a deep breath, and jump. Copyright © 2019 Pisom Jeans. All rights reserved.